For one weekend every year (last weekend this year), a part of Auckland transforms into a bustling celebration of Asian culture and commerce. Lanterns are clearly the highlight of the Auckland Lantern Festival, but there are also performances, trinket-sellers, and food, glorious food. Every year, the event gets a little bigger, and for the first time this year, it was even split out into two different locations. Most of the attractions were in and around Albert Park as usual, but this time, there were also outdoor movies and family activities on Queen's Wharf. Advertising for the Auckand Lantern Festival on a bus. We didn't even look at the programme before heading in to town, because we were mainly there for the food; the lanterns were around the whole weekend anyway. This did mean that we missed some great shows, including sand painting, a kite making demonstration, and the grand finale fireworks. We did however manage to eat, take pictures, and immerse ourselves in the crowd, albeit one which was not used to coping with the sheer amount of people. We even caught the lion dance, in which one of the three red lions somehow managed to turn a gold and a silver one, while moving to the rhythmic beating of drums. The lion dancers somehow managed to make it past the crowd by the food stalls. Although some of the food at the festival consists of things you can get at restaurants or takeaways anyway, there was also a lot of street snacks (plenty of things on skewers), as well as items you don't normally see, like the toffee strawberries below, or freshly pressed sugar cane juice. The volume of people not only added to the atmosphere, but ensured food was freshly cooked where appropriate. Fried dumplings and squid on a stick. People kept walking past with strawberry skewers held up high, some with up to 6 or so sticks in their hands. We found the source of this delicacy and placed ourselves in the shortest queue, salivating with every step forward. Unfortunately, once we got to the front, we discovered that we were in the wrong queue. They were only selling meat jerky from our line, despite being one and the same shop. We left for a couple of hours and looked around before attempting to join the queue again. This time, after we had waited for a few minutes, they called out that they had sold out. 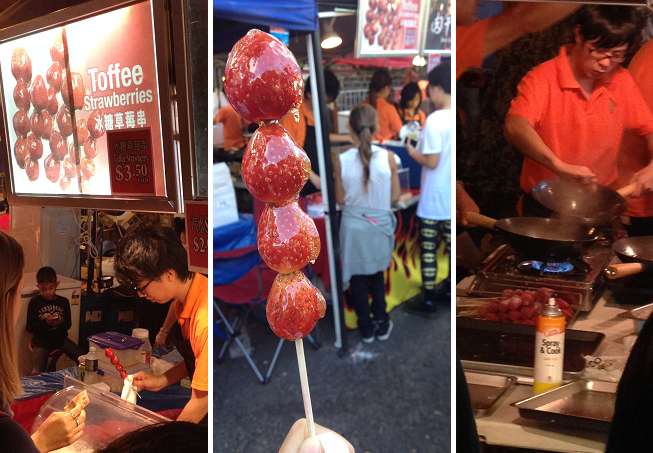 At $3.50 for four little toffee-coated strawberries, the skewers were not cheap, but people clearly loved them! The very popular toffee strawberry stand, which also sold beef and pork jerky. We returned the next day, and went straight to this stall before purchasing the savoury components of our meal. We finally got to try toffee strawberries, and they were indeed delicious, with a sweet, crunchy outer shell that gives way to a warm, fruity explosion. It was really interesting watching the buns and dumplings being cooked by Chinese Dumpling King Restaurant (shop in Mount Albert). While the bottoms of the products were frying on a hot pan, the tops were being steamed under a metal cover. I imagine the food would have been hot and fresh and delicious, and good value too ($5 for 6 buns or 10 dumplings), but the queue was a deterrent, and we figured that we could simply go to the restaurant after the festival anyway. Fried pork buns and dumplings being cooked. The most expensive dish we saw for sale was the grilled crayfish tail from Oceanz Seafood. On Saturday night, it cost $18, marked down from $20. The next night, however, the price was down to $15, so we decided to spoil ourselves. There's supply and demand in action for you. Grilled crayfish tail from Oceanz Seafood. This was actually a good choice, as the crayfish was delicious in garlic butter. You also got a bit of seaweed so it feels more like a meal. A number of stalls were selling meat skewers for $1 per stick. For $1 you could also buy deep fried things such as durian rolls and taro cake. Durian rolls, taro cake, spring rolls and dumplings at a vegetarian stall. 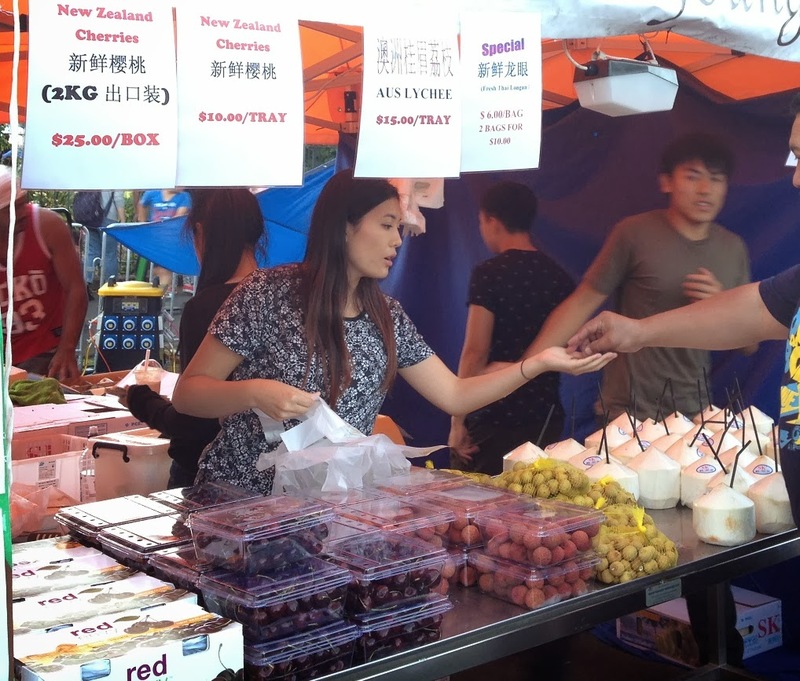 The range of food on offer at the festival included such cuisines as Chinese, Malaysian, Filipino, Vietnamese, and Thai, but we were surprised by how strong the Taiwanese representation was. From pearl milk tea to Taiwanese sausages to popcorn chicken to rice tube pudding, we saw maybe 10 stalls selling Taiwanese food, and that's not including the stalls that sold pearl milk tea along with other things like Hong Kong Curry Fish Balls. In comparison, we only noticed one Vietnamese stall, and a couple each of Thai and Malaysian ones. The other type of stalls we saw a lot of were the ones promoting vegetarian food, often run by Buddhist organisations. They seemed to be more intent on proving that ethical vegetarian food can taste good, rather than providing any healthy offerings. As such, there were very few salads to be seen, but plenty of deep-fried snacks and imitation meat. One of the stalls offered tofu jelly or tau fu fah, which is not something that you often get to eat here, unless you make it yourself or go to a fancy Chinese restaurant. Although there was an attractive picture shown on a wooden pail, however, the actual dish offered was nothing like it. First of all, it didn't come from the pail, which actually only contained the sugar syrup for the dish. Secondly, the jelly had the wrong texture, somewhat curdled and grainy, rather than being silky smooth. Then came the flavour, which had a slightly bitter aftertaste, as if they had added too much gypsum. Finally, the syrup was not golden brown as shown in the picture, but a clear and colourless sugar water. What a waste of a perfectly good $5. Syrup for tofu jelly and bottle of black soy milk. Most of the food at the festival was intended to be eaten straight away. We took home some deep-fried coconut buns from a vegetarian stall, but we wished we had remembered to purchase some cherries, lychees and longans for later too. Fresh fruit and young coconut water for sale. For those who do not care for Chinese food, there were still plenty of options at the Lantern Festival, from gourmet food trucks like Urban Escargot selling pork belly burgers, mussel fritters and snails in green curry, to the standard vendors of hot chips, hot dogs and kebabs. The seafood mentioned earlier, including the grilled crayfish tail, would appeal to all, but perhaps the most popular non-Chinese food was in the dessert category. Mini donuts flew like hot cakes, children walked around with candy floss, and ice cream in watermelon (which you find at many festivals including Pasifika and the Grey Lynn Park Festival) was jazzed up to include paper peacocks and served using a variety of fruit, including rock melon and pineapple. After you have eaten your fill and the darkness of night takes over, it is time to enjoy the lantern displays! Dragons around a post lanterns. Avoid driving. You have better things to do with your time than sitting in traffic, or going round and round a parking building very slowly. Walking is a good option, as is riding a bike. Trying to catch a bus may be problematic if you are at one of the last stops, and all you see are full buses that just keep going past. Gridlocked cars in parking building. Go with friends so you can share, when you are forced to buy food in larger quantities than you want to eat. Failing that, be prepared to take food away, so that you can try more items. For even greater variety, come back on multiple days. Not only will you have more stomach space to play with, you might see some new stalls too. Don't go right towards the end of the evening. The more popular items might be sold out, and they turned out the lights at 10:30pm (in the food area, not the lanterns in the park) even though the place was still buzzing. Relax and enjoy. This is particularly important because someone is bound to be in your way, or accidentally bump into you, in the crowd.